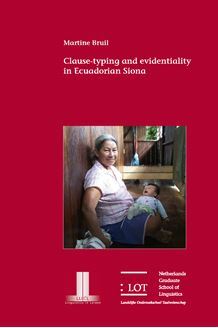 Martine Bruil Clause - typing and evidentiality in Ecuadorian Siona Ecuadorian Siona is a Western Tukanoan language spoken in eastern Ecuador . One of its remarkable features from a cross - linguistic perspective is its clause - typing system . Ecuadorian Siona has a special clause type for reports : the reportative . In the majority of the worldâs languages , the reportative is considered to be an evidential category rather than a clause type . The reportative expresses the speakerâs access to the uttered information , namely , that it was obtained from someone else . The Ecuadorian Siona reportative is mutually exclusive with three other classical clause types that are part of its grammatical inventory : assertions ( assertive clauses ) , questions ( interrogative clauses ) and orders ( imperative clauses ) . The reason that the reportative can be considered as a separate clause type is that it has distinct subject agreement paradigms like the other clause types . Moreover , it exhibits clause - typing semantics . This dissertation presents an in - depth study of the clause - typing system in Ecuadorian Siona . The morphology and the semantics involved in it are discussed from both a synchronic and a diachronic perspective . The study also contains a phonological sketch and an overview of the main nominal morphology , which are crucial for a reconstruction of the historical process underlying the Siona clause - typing system . Finally , the dissertation provides novel insights in the nature of both evidentiality and clause - typing .